fraction of what you would have paid. Even better, you get to reap the rewards of leftovers! 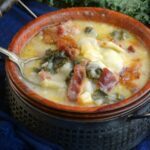 This soup is one that I crave when the weather begins to get chilly, it is such a hearty and comforting soup, that I highly recommend making. the nail on the head with the flavors. It took a little practice and adjustments of ingredients but I think I nailed it. A few weeks back the sun was shining and I actually thought spring was finally here. Then we wake up and look outside to see a blanket of snow had fallen during the night. 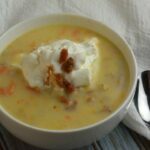 These random snow storms are not my favorite, but it allowed me to have a good excuse to whip up this creamy and hearty soup. Luckily I had all the ingredients on hand and I didn’t have to venture out in the cold. just half an hour. 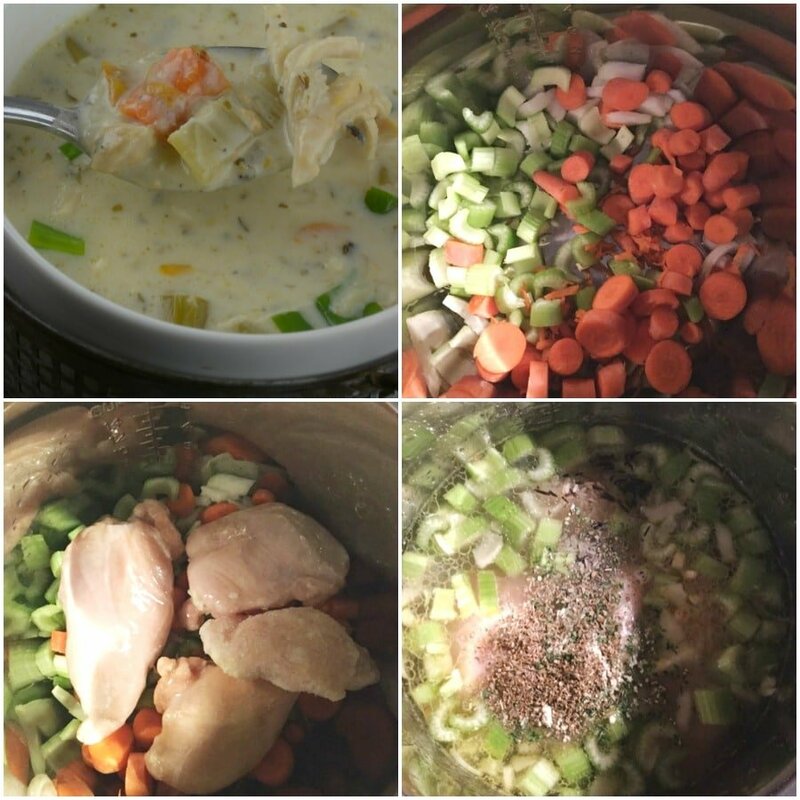 Trust me if you try this soup, you will be back for the recipe, to make over and over again! Yes, you are welcome to use frozen boneless chicken if you want, or fresh. You will just have to allow your Instant Pot to take longer to come to pressure. 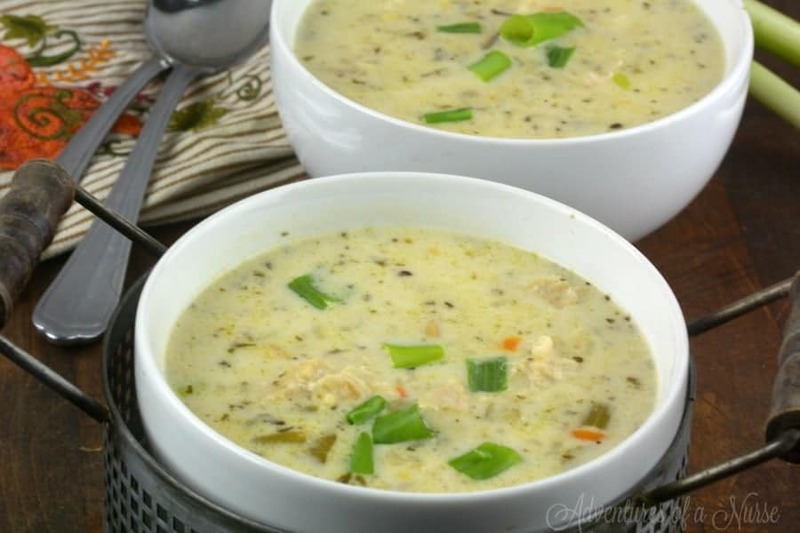 But you will still get an incredible, flavorful, soup to serve up your family. Absolutely! Feel free to use vegetable stock if that is what you have on hand. The flavor will slightly change, but overall you should have a very similar flavor. I don’t recommend using low sodium, for that will take away a lot of the flavor in the dish, and could leave your soup tasting off in terms of being a true copycat recipe. If you have leftovers make sure to place in an airtight container and place in the fridge. Your soup will stay good for up to three days time. When you want to reheat you can warm on the stove top, slow cooker, Instant Pot, or even reach for your microwave. 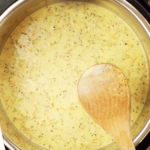 Just stir randomly as it warms and heats all the soup. I haven’t tried freezing this soup, but you are welcome to try. I find that soups with a milk base can tend to curdle as they freeze. If this happens to grab a whisk and really give it a good stir to help break up the clumps. 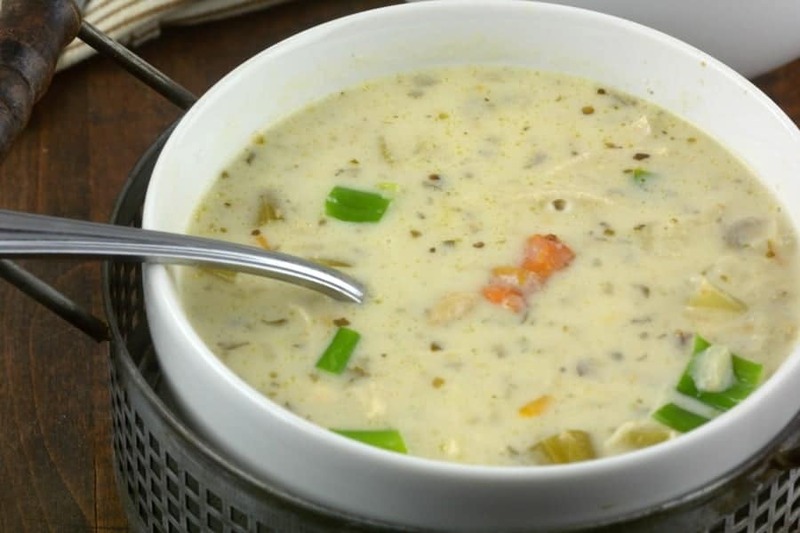 Even if your soup curdles a bit it will still have great taste, just the texture will be off. If you do freeze, place in a freezer bag or airtight container, and then toss in the freezer for up to three months. Thaw in the fridge the night before you go to warm it up. You have so many options for side dishes to pair next to your wild rice soup. If you need some inspiration here are a handful of ideas to get you started! 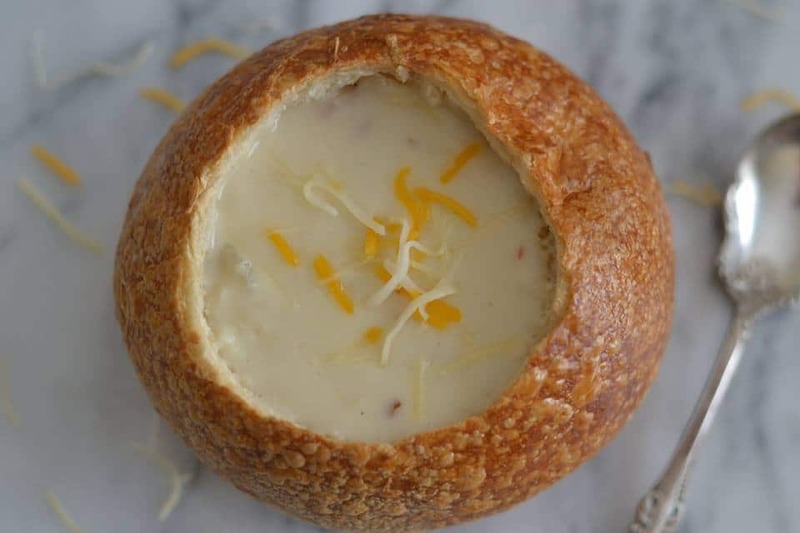 The sky is the limit on what works to go next to this soup. You have some tasty options so go with what you feel like! 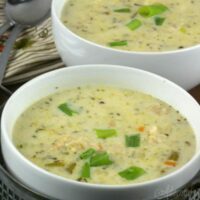 As you can see this Instant Pot copycat Panera’s wild rice soup, is going to be a winning dish. You might even say a family favorite. Give this recipe a try today and see how you like it! Place the instant pot on saute add oil, garlic, onion, and veggies in the instant pot. Add Chicken ( mine was frozen). Add chicken broth, rice a roni, and packet of seasoning. Mix 1 cup of your broth with 2 tbs cornstarch to make a slurry. Pour in heavy cream and slurry, continue to saute until it thickens. Note it does thicken more as it stands. Enjoy! Love this soup! Thanks for the recipe! I also only added 1 c of chicken broth since I didn’t realize I was supposed to save some back. Oops! I meant I added 1 extra cup of chicken broth on top of the 32 oz. used. Thank you for this! I did not want to use rice-a-roni. How much rice did you use to make your own rice-a-roni mix for this soup & can you use long grain brown rice? Have made stovetop version of this recipe alot, so had to try Instant Pot version. Instant Pot is ALOT easier, quicker and as good as Panera’s. I did a couple of modifications. One was I used Uncle Bens fast cook Long Grain and Wild Rice. As a result, I decreased cook time to 15 minutes from 30 minutes. I think this time reduction was also best for the chicken breast – which would have been overcooked at 30 minutes. Like another commenter, I used 5 cups broth total. 4 initially and 1 for the slurry. This was so good! My chicken breasts were a little big so the “chicken/rice ratio” was a little off but that’s on me for the size I bought. For those who said they didn’t know you have to withhold a cup of broth- to make a slurry all you have to do is take a cup of the already cooked soup broth from the instant pot, mix it with the cornstarch and return to the pot to thicken. That way you don’t have extra broth (unless you want thinner soup). I’m for sure adding this to my rotation! I did the same and turned out great! This was delicious!! My husband ate it without adding ANYTHING to it…even Tobasco sauce! My 10 year old daughter, who is a now picky eater, ate a big bowl! I added an extra cup of broth as well to make the slurry. The soup was plenty thick! I wonder if you double the recipe, would the cook times remain the same? Also if my chicken is not frozen should I decrease the cook time? Used uncle bens long grain and wild rice (in the box) but use 2 boxes; used the whole 32 oz carton plus one cup of stock and one cup cream; cooked for 15 minutes. FYI, cornstarch is missing from the ingredient list! I made this chicken and wild rice soup.The first time I had too much chicken do to the fact that they were large breasts.IT didn’t have enough wild rice that way.So in the next batch I had 1chicken breast and 2 boxes of the wild rice.I also added 2 cups of water to help thin it out a bit.The flavor was awsome in both batches.Now I just have to get the right ratio of chicken and rice right.I’ve already recommended this recipe to other family members and friends.Me and my family love it. My chicken is already cooked. When would you suggest I add it in? 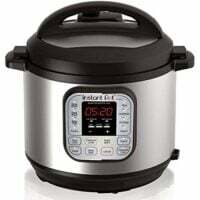 I’m a total newbie and I’m intimidated by the instant pot! I ha e the 8 qt. Can I double with recipe and also use half wild rice and half white? How long should you cook in the instant pot if your chicken isn’t frozen? Turned out well. I read the comments and reduced the cooking time to 15 minutes as I used the Uncle Bens fast cook wild rice. Rice was a little mushy. Used 1/2 cup milk to make it a little creamy. Overall good dinner. My family and I thanks you for this wonderful recipe. It was delicious and very satisfying.